Ever wanted to know even more about time travel? Despite the vast numbers of great science fiction cinema, there are only around 30 movies that directly involve time travel in the plot. Many have been individually analyzed and scrutinized, but designer "Mr. Dalliard" decided to take on the task of organizing all of them together. So he made the "Time travel in movies" flowchart (found via FastCoDesign) which details the different functionality, worlds and time processes used in each film that differentiates them. It's actually an intelligent breakdown of time travel films and the ideas in them, like the Novikov self-consistency principle. Here is the complete flowchart from Mr. Dalliard, who also comments (in 3rd person) on his Tumblr blog. Click above for the original full-size version. The Novikov self-consistency principle is an idea developed by Russian physicist Igor Dmitriyevich Novikov in the 80s to solve the problem of paradoxes in time travel regarding interaction, essentially saying that it is impossible to create time paradoxes. It's referenced mostly in Twelve Monkeys and Harry Potter and the Prisoner of Azkaban with the Time-Turner they use. 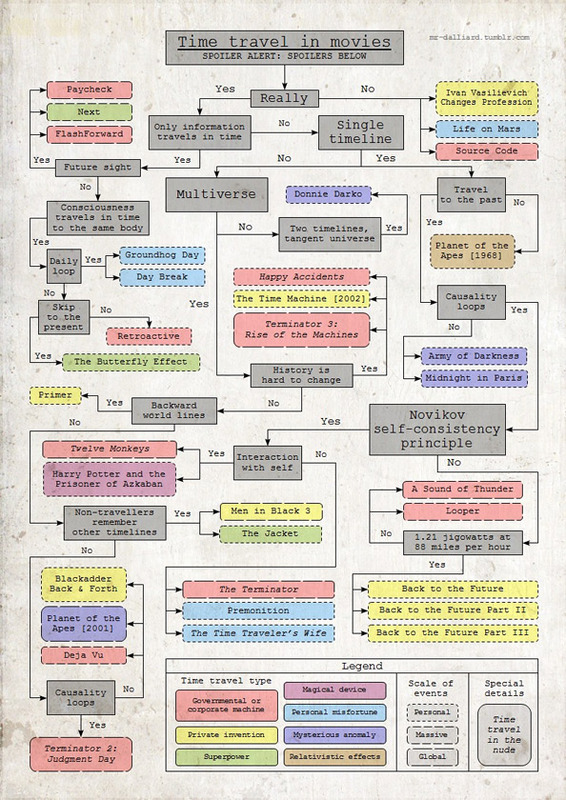 This is a fun guide that helps break down the concepts used in so many great time travel movies, from Planet of the Apes to Looper to Donnie Darko to Primer to Groundhog Day to Deja Vu, but it obviously contains some spoilers for the events in these films. A few of these concepts might be explored in Nolan's Interstellar next. Didn't see Time After Time listed up there. It directly involves time travel; H.G. Wells traveling forward in time to catch Jack The Ripper. It stars Malcolm McDowell and Jack Warner and is a pretty good film. Damn it! I have to watch Donnie Darko again. Technically, isn't Primer using alternate realities like Source Code, not 'real' time travel? No, there aren't alternate realities, because all versions of the same characters fold into the same timeline, and not separate ones. It just gets consistently rewritten. No, they definitely are not. If they were all the same timeline, then when Abe unintentionally stops himself from entering the timeline, then he never would have entered, creating a loop that would never be fixed. What happens instead is Abe goes back in time, a new timeline that can be re-written for him, and he does whatever he can to rewrite it however he can, whilst avoiding himself so there isn't two or three of him (which, ironically, happens). So, technically, there isn't real time travel. Did that make sense? I would consider primer real time travel because they are technically traveling through time. Yes new timelines are being made, but that is still considered time travel like a bunch of the others listed on there (looper, back to the future). Source Code is a virtual reality machine. At the end of Source Code, they say that they aren't virtual realities, but new alternate realities, like the new timelines (a different way to say alternate reality) seen in Primer. Looper and Back to the Future are way different, one singular timeline, as can see as future versions of the characters change as they affect the younger version. They aren't traveling in the same time zone, though. They're traveling to a different one, happening simultaneous to the one they left that has the exact same events occur up until the moment they travel. That's definitely alternate reality, not time traveling. Ok, so so that's the parallel dimension theory. Interesting. There are some disputes about whether Primer is actually under that theory, but it's too much for a casual movie viewer like myself! I'll read up on it more another day. Alright! Thanks for a good discussion, I love talking time-travel films, especially Primer. There's just so much there! It's one of the reasons I'm so excited to see that director's follow up, Upstream Color, on Saturday! Does Time Traveler's Wife count as interacting with self since the older version hangs out with the younger version?